The cover for the audiobook of Family Ties, my first. I just got the files from Michael and will review them next week. I look forward to the release of my first audiobook! Audiobooks aren’t cheap, unless you are such a famous author that producers will offer you a profit share. I’m not. But I am very proud of this product. I’m sure you’ve heard the age-old controversy between the “book” and the “movie”. It goes without saying that the book will always lose, at least if the movie was based ON the book. The book will always be much more close to the reader’s views of the novel, whereas a movie, apart from the demands of the medium, is the interpretation of the book by the screen writers and the director. Incomparable. Completely different mediums, and to compare the two is like comparing a flight from LA to NYC with a train ride between the two cities. The same is true for the audiobook. I’d say the audiobook is somewhere in between the movie (minus the visuals) and the book (plus the voice, and ONE person’s interpretation of the narrative). When I chose to work with Michael Bakkensen, himself the father of relatively small kids, I know he’d understand that aspect of the novel, parents’ need to protect their kids, and he’d get the interaction within the family right. I don’t know Michael well enough yet, we will meet in New York for Rainbow Book Fair in April, to know if he has siblings, or his relationship to his parents. Families are complex and as the covers suggests, the roots of a family tree run deep, lots of secrets, lots of hidden aspects, connections here, there and everywhere. The relationships are interpreted differently by the two sons, old secrets suddenly come to light, and ancient wrongdoings are the downfall of one patriarch. Those and many other ingredients are part of this novel. Family Ties was the first book I ever wrote. By now it’s not big secret that it includes a lot of my own personal “baggage” that I knew I had to deal with. I had a hunch that it might always come back to haunt me if I didn’t face those demons. What those are, and how, is irrelevant really. But needless to say, they are vanquished. On the other hand, my writing is still greatly influenced by experiences from my personal life, even though it shouldn’t influence your enjoyment of the book or the audiobook to know how, what or why. 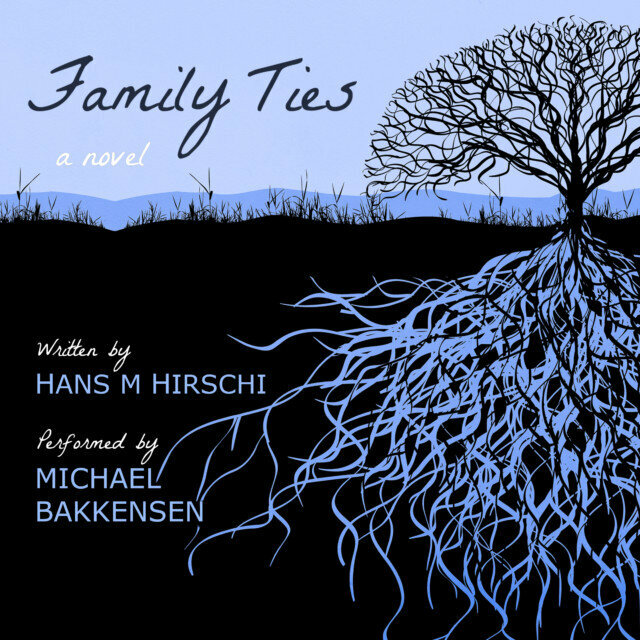 The Family Ties audiobook is available from Audible, Amazon and iTunes. It’s about five hours long to listen to, and believe me, Michael’s voice is very addictive! If you’re interested in more background info about the actual production process, listen to my YouTube video I uploaded yesterday. I really look forward to this weekend off. It’s been a somewhat “harrowing” week for us here at home. Next week is going to be “fun” I hope, as I have another release waiting, this time my tenth novel “Last Winter’s Snow”. Oh, if you’re interested, I’ll be on a radio show this Sunday, at 3 pm EST (9 pm CET) to talk about the new audiobook and novel (and anything else readers want to ask about). We’re also in the iTunes radio directory and the TuneIn Radio app. See you Sunday? You can also join the Facebook event group and drop off questions. If not, have a great weekend. Have you enjoyed this post? Please share it with others. I love to connect with my readers, I really do, so feel free to interact with me on Twitter, Facebook, YouTube, and/or Instagram.